This is the PORTABLE version of our 392m antenna! If your setting up for Field Day and want to work all the HF bands from 80m to 10m, this is made for you! You can beat this one up and it will keep going! Not like the telescopic antennas on the market for portable use. Included is the coil, tap wires, heavy duty aluminum tripod bracket, two section adjustable whip, counterpoise wire, and 5' compact yet sturdy tripod. Everything you need except the radio and coax! Not only will this work on ALL HF bands from 3.5 to 30 Mhz, it also acts as a half over half high gain antenna on 2 meters! We have made some improvements on this already great coil! Also, we are soldering direct to the end cap bolt instead of using a terminal ring. This is of coarse 100% sealed and waterproof! Go on youtube and look up "TRX Communications 392M Antenna Mobile Test " you will see the mobile version of this being tested. This antenna can take a beating! I along with others use this antenna on the top of the vehicle. Open to all kinds of abuse from trees to drive-through's! Also, the tap wire connections have been put through the test as well. Need to worry about replacing this antenna for a very long time. The idea for this antenna was conceived during the replacement of a gear motor for a "screwdriver" style mobile antenna. Third time replacing the motor. I also had replaced the beryllium contacts several times along with the drive. We thought Wouldn't it be nice. To have a mobile/portable antenna that can cover 80m through 10m CONTINUOUSLY without gaps with no internal moving parts to wear out? Would need to cover the entire range so that it will be friendly to CAP or MARS operators as well as marine frequencies. It needed to use the standard. 3/8 x 24 thread mounts that are so common and diverse. Yes, it needed to be unaffected by the elements. Of everyday driving and extreme weather conditions and easy to keep in working order. 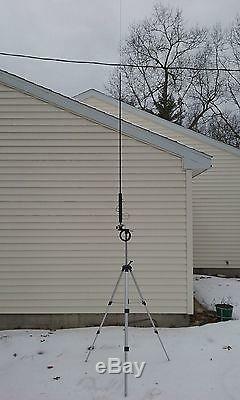 "No nonsense" HF mobile/portable antenna system that is all of the above! There are other "band tap" style antennas on the market such as. The Outbacker and Opek, but this antenna is different, not only does it cover the entire frequency range (not just certain bands), but it does. It with more efficiency and it looks better while doing it! It will also cover 6 meters when you shorten the adjustable whip provided. This will handle 600 watts of power, more than most mobile installations. This comes at a cost far less than the. This is a RESONANT antenna system! Words, this is not one of those "no tune" antennas. If you see an antenna that claims to work on all frequencies without tuning, don't be fooled! Those antennas do work and you can make contacts with them, but they do not come close to the efficiency of a similar sized resonant antenna. They have a transformer at the base of the antenna that is more like a dummy load with a whip on it. Here are some reviews from our customers, I have many more and will be posting them in due time. Just wanted to say hello, and to let you know your antenna coil is performing beautifully on my setup and is now proudly displayed on QRZ dot com. Thanks again for such a quality and well performing product! I have it installed on my Chevy Trailblazer using a Comet RS-480. "Lip" mount on the top of the rear driver side door. I found the antenna very easy to get matched and working on 40-10 meters, which were the only bands that I was really interested in. I realize that the Comet is not an ideal mount but it is what I was using with Hamsticks. I have worked in to Europe on 20 and 17 meters from here is Wisconsin and gotten 59 signals reports. I have also worked from coast to coast here in the USA on 20 and 17 meters. I also worked Europe on 40 meters. I will be looking forward to your web site and as I operate mobile I will try to point other hams to your web site. Thanks for a good product. 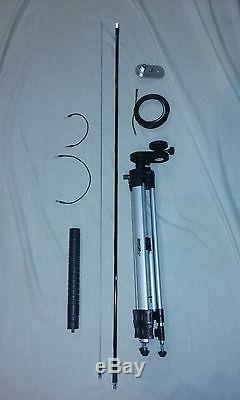 Before I bought your antenna I bought a similar multi-tap antenna that MFJ just introduced. I found that their advertising was very misleading the antenna was several feet shorter than advertised and every time you changed bands not only did you have to change the taps but you also had to readjust the whip. I have set this antenna up for 6 meters and that is all I will be using it for. If there was any thing that I would have liked to have seen with your antenna was the ability to tune it for 6 meters. Also check out Jason Gant W^AUX's web page for a review of the antenna with him and Gordon West. All coil connections are wrapped then soldered for strength. Tap connections are solid brass. Uses standard mobile mounts with 3/8 x 24 thread. Coil is 12.0" x 1.5". Adjustable from 6' to 9' total height, then just use the taps for frequency adjustment. I have been building antennas for a long time. I have been a ham since I was 15 years old and have never lost interest in the hobby. Ham radio is a "people" hobby where they help one another and learn from others. I consider myself very lucky to be able to earn a. If you have a question or problem PLEASE contact me and I will work with you to get the most out of your. Rarely, someone needs help to get things working properly, HF mobile can be very tricky and your installation much more. Critical than that of VHF and UHF. I will do everything in my power to make this a good experience for you! Go down the list in my feedback, there are. Many people who love the antenna and are amazed at it's performance! Yes, on 40 and 75 meters as well, not just the "easy" bands. Thank you for considering this design for your mobile or portable use. And at home for those HOA's!!! The item "392M HF Portable antenna mars cap all band 80 10 meters 60 40 30 20 17 15 12" is in sale since Monday, August 27, 2018. This item is in the category "Consumer Electronics\Radio Communication\Antennas\Ham, Amateur Radio Antennas".